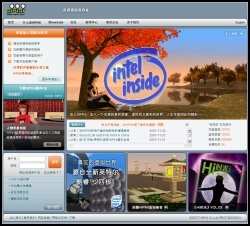 Chinese news source Pacific Epoch reports that global semiconductor superpower Intel opened a store on November 22 in the Beijing-based virtual world HiPiHi (a Chinese virtual world similar to Second Life). Intel is the first IT enterprise to set up shop in HiPiHi. Intel plans to build a 160,000 square meter virtual island and open an Intel experience center, activity center, and partner club for the virtual community. With all of the intellectual property and privacy law issues surrounding Second Life, there are bound to be some really interesting legal developments arising from HiPiHi, especially in light of the authoritarian Chinese government’s ongoing surveillance and content control of the Internet, and HiPiHi’s plan to allow IP ownership. I’ll be keeping an eye on all virtual world legal developments in China for VB, and will provide updates as they arise. Intel and HiPiHi said they will release Intel notebooks and mobile Internet devices in the 3D world. Not clear yet what this will entail, but imagine logging into HiPiHi, sitting down at your HiPiHi/Intel notebook and using it to log into Second Life. The rabbit hole may have just gone a little deeper! For those interested, check out this YouTube video showing off the HiPiHi world. In my opinion, there’s another reason China could entirely dominate the virtual world space… and it has to do with IP.